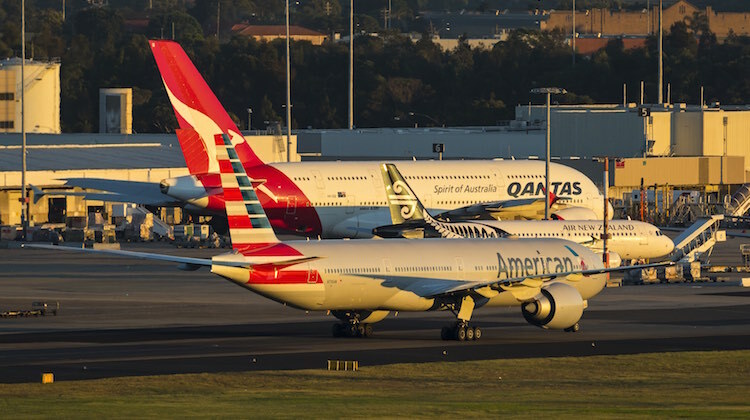 Qantas and American Airlines plan to make another effort to convince US regulators the pair should be allowed to form a joint-venture partnership on trans-Pacific routes. The two oneworld alliance members announced over the weekend they would submit a new application to the US Department of Transport (DOT) for anti-trust immunity (ATI) on a metal-neutral, revenue-sharing joint business agreement. While their first application was rejected in November 2016, there was hope that a new administration at the DOT following the change of US president in January would come to a different decision. American Airlines executives confirmed during the company’s quarterly earnings call on January 27 (US time) the company intended to have a second attempt at convincing the DOT of the proposed consumer benefits of the tie-up. “We are hopeful that the Trump administration will give the Qantas JV application a second and more favourable look,” American chief executive Doug Parker said during the earnings call, according to a transcript published by SeekingAlpha. Steve Johnson, American executive vice president for corporate affairs, said a new application was “probably a few weeks down the road”. “We are looking forward to doing that and having another opportunity to make our case,” Johnson said. American’s decision to start flights from Los Angeles to Sydney in December 2015 – and Los Angeles to Auckland in June 2016 – prompted the two carriers to seek ATI as part of an expanded joint business agreement to reflect the US carrier’s entry into the market with its own aircraft. Their first application, lodged close to two years ago, was rejected by the DOT in November 2016, with the Department arguing the pair’s combined 60 per cent market share of all seats between the US and Australia would harm competition and reduce consumer choice. Moreover, Qantas and American would, together, be the largest operator on about 200 city-pair markets, which would be sufficient for the alliance to “exert market power”. “There is a high risk of competitive harm from approving and granting anti-trust immunity,” the DOT Show Cause Order said. The DOT also questioned some of the claimed consumer benefits in Qantas and American’s application that would result from having their anti-trust immunity approved. The Australian Competition and Consumer Commission (ACCC) and New Zealand Ministry of Transport took a different view, giving the partnership the green light during 2016. The ACCC decision meant that while Qantas and American were able to align pricing on tickets sold in Australia, the pair was not able to do so on outbound US fares without DOT anti-trust immunity. The US end of the market has seen some extremely low fares in recent times as additional capacity from the likes of Qantas, American and United, as well as some currency changes that have affected demand and pushed down ticket prices. More specifically, American fares for its own service to Sydney were regularly much lower than Qantas-operated flights, which put pressure on the financial performance of the Australian airline’s US operations. Qantas said in a statement on January 28 (Australian time) the decision to refile an application came after a review of the US DOT’s November Show Cause Order. “It’s both airlines’ view that the DOT’s decision didn’t take into account precedent, intense competition on trans-Pacific routes, or the benefits that a closer relationship between Qantas and American has already delivered, including two new routes,” Qantas said. Qantas said it would remove its QF airline code on American’s daily Boeing 777-300ER Sydney-Los Angeles service from February 1, as well as tweak frequent flyer arrangements with the US carrier from May 1. The Flying Kangaroo said the move was part of efforts to “scale back areas of cooperation that aren’t viable without immunity”, arguing the airline “does not have any free sale codeshare arrangements on overlapping sectors with any other partners, outside of similar joint business arrangements”. “It will mean people will not get the same status credits as they got on American Airlines aircraft, because we don’t do that with any other carrier on routes without a joint venture,” was how Qantas chief executive Alan Joyce explained some of the frequent flyer changes during a media event in Los Angeles on January 27, according to Fairfax Media. “So consumers lose out. We just need to go and make that very clear to the DOT, and that’s the main case we’ll be making: customer benefits that are associated with the alliance. The Australian carrier said it would continue to place its QF airline code on American’s Boeing 787 Auckland-Los Angeles service and on US domestic services. While Qantas and American, at least publicly, expressed surprise at the DOT’s November decision, aviation analysts believed getting the proposed partnership approved was always going to be a tough ask. “Qantas already has the bulk of the capacity, so I don’t see how adding American would be better for passengers or help reduce fares,” Singapore-based Shukor Yusof, head of aviation research firm Endau Analytics told Australian Aviation via email in December. Former Qantas chief economist and the managing director of Airline Intelligence and Research Tony Webber said his analysis suggested ticket prices tended to increase when a competitor was taken out of a market. “Typically when you go from a four- to a three-player market it will add about 12 per cent to fares,” Webber told Australian Aviation in an interview in December. The other two major alliance groups on the trans-Pacific market are the Delta Air Lines-Virgin Australia tie-up and a JV between United and Air New Zealand. I am trying to buy a return-home-for-a-break ticket on a longish US trip and note if I buy a QF ticket ex US it is a thousand more than a ticket ex Australia and a thousand more than an AA ticket on the same flights. A tie up will mean the price will still be more ex US than ex AUST. I will buy two return tickets ex Australia instead. Hopefully this doesn’t get approved. Qantas doesn’t need more of an advantage on these routes as its the carrier with the largest market share between Australia and the USA. This will hurt smaller competition such as Air New Zealand, and Hawaiian Airlines.